San Francisco, CA - April 2nd , 2014 NAB Show - Fiilex, a leader in LED lighting for the broadcast, film and photo industries, announces the release of their newest lighting kit the K681. 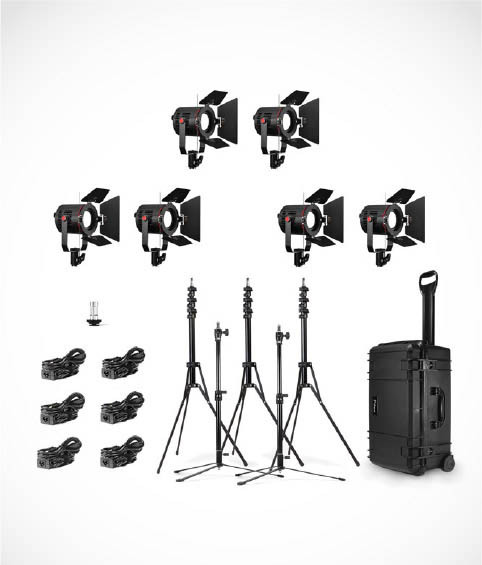 The kit is comprised of six award winning P180E Lights w/ Barndoors, 6 AC/DC Power Adapters, 3 Reverse Leg Light Stands, 2 Back Light Stands, a Cold shoe Mount with Stud, and a Rolling Travel Case. The P180E is a great light for working in various environments and weather situations. It has an effective output of 200W (40W draw), Color Tunabilty for lighting temperature adjustments between 3000-5600K. The light also features Enhanced weather protection and has an IP-24 rating. "At times you just need more lights, if you are shooting interiors with lots of nooks and crannies, or shooting advanced lighting patterns, you don't need more power, you need more light in separate places," says Brent Siebenaler Brand Manager for Fiilex, "This is a great kit for the DP who needs to build depth into a scene, for the architectural shooter, and even for the Portrait photographer. With K681 Kit you are never limited by your lights, just your imagination "
The P180E utilizes Dense Matrix LED™, this patented technology allows for placement of many LED chips in a tightly arranged pattern. The result is a super - bright point - like illumination source with high CRI (Color Rendering Index) and adjustable color temperature. This proprietary technology is unique to Fiilex. The added features of the P180E are: a 200W equivalent output (40w Draw), runs on AC power or standard broadcast batteries, cool to the touch housing, and a magnetic accessory mount. Available accessories include a Dome Diffuser, Fresnel Lens, Gel Holder, Umbrella Holder, Rain Shield, D-Tap Cable and more. The K681 Kit comes in a Seahorse hard shell case w/ wheels. The case is built to military Specifications and has a built in pressure purge system that removes excess air, and helps keep the inside free from dust and water. Fully loaded the case is 40 Lbs, and because it is solid state technology, you can check the case on a plane without worry. There are no bulbs to crack or replace. The K681 is available now from dealers throughout the U.S., Canada, and Europe. The U.S. retail price is $3,995.00. For a complete list of dealers and accessories please go to www.fiilex.com.